Finally got out and took advantage of the last snow fall to blanket Upper Paugussett State Forest with 6 inches of powder. I should have skied on Sunday when we got the snow but just wasn't feeling it, not to mention it was 20 degrees and pretty windy. Above is the route I took today. 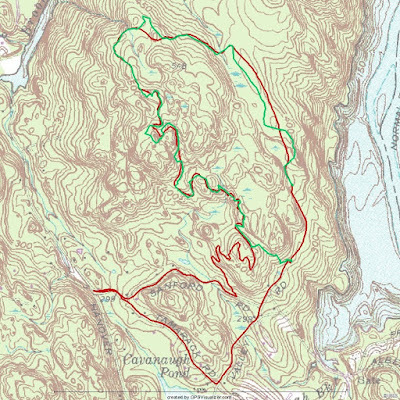 The grey line is the approximation of the logging road because I forgot to turn on the GPS. I started with a blaze orange, windstopper fleece jacket that I normally wear during hunting season but that got too hot, 15 minutes in. Went to a vest for another 15 and then took that off too. Stayed with the sweater, zip jersey, and riding shirt underneath. Couldn't find my long johns so I went with my riding tights and BDUs. 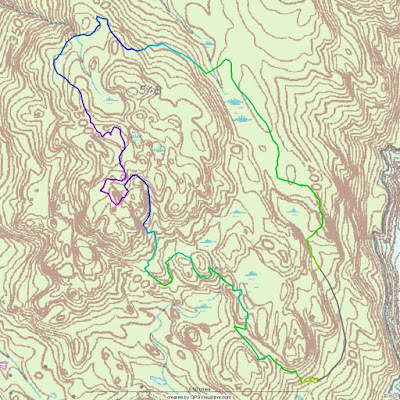 To give you an idea the route I took compared to how the trail is normally ridden I overlayed my last mountain bike ride on the Gussy and I have to say while it's a great trail to ride, it is not conducive to Cross Country Skiing. Still, it was worth spending two hours in the forest and getting an outstanding aerobic workout! Doesn't look like that No Motorized Vehicles sign is having any impact! Looks like the kid on Bramble Trail had a field day on the Poly Brody. At least, that is my guess because I drove by the other end later and found ATV tracks leaving the forest in the direction of Bramble Trail. Also the first house on the left, on Bramble trail has quite a few ATV tracks around, not to mention on particular set exiting the property onto the road. Yesterday, I saw a bunch of cars parked at the Pond Brook Boat Ramp and quite a few of them had bike racks. Looks like they had a great day of riding, too. No ATVs on the Mulikin Trail so I went this way for the fresh powder and then took the little connector trail back to the Poly Brody. No way was I going to take it all the way down, that descent would be deadly on the skis. At the Gussy Trail head (above) you can see where the bikes went in (or came out). The ATVs seem to have churned up a lot of leaves. They probably came through on Sunday, just after the snow. No this is interesting. It would appear that the riders took the connector trail that NBLA made back in the day to the blue trail but all the signs that I saw further down pointed to riders coming up the Gussy Trail rather than riding down it. Could be they went both ways. Were it not for the bike trails there would be far fewer unauthorized motor vehicles in the state forest. Mountain bikers should admit their culpability. How can you say that? Before the mountain biking trail (Upper Gussy) there was a lot more motorized activity in the forest. I ride in the forest at least once a week and the amount of beer cans , empty water bottles, jugs, and containers that don't fit in bottle cages, and snot rags I find is astounding. Those aren't coming from mountain bikers, so it must be hikers/walkers! So, you need to admit culpability in your inability to police up your own trash!